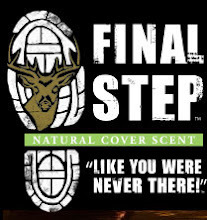 Final Step Cover Scents! Welcome aboard! We would like to introduce our new sponsor. "Final Step Cover Scents" I have tried a lot of the cover scents/odor eliminators on the market, but I have not found anything like this, its long lasting and has a natural smell that is unbelievable. These scents are made here in the USA and are 100% natural. We are very excited to add this product to the Goodman Outfitters artillery! We will also have became a dealer for the product and we have it in stock. If you would like to try it out let us know. Its offered in 4 different natural smells. Cedar, Juniper, Sage, and Grease wood. You can read more about the product on their website by clicking the final step logo. We are very happy to announce the winners of our 2012 ISE show raffles. Congratulations John, we look forward to hunting with you in near future. We would like to THANK YOU all that entered our hunt raffle. We met so many wonderful people throughout the show and wish we could take you all. We will have more raffles in the future so stay tuned. For those of you that didnt win and would still be interested in booking a hunt with Goodman Outfitters please give us a call. We would love to have you in camp. Congratulations to Justin on the arrows. Victory makes an outstanding product. 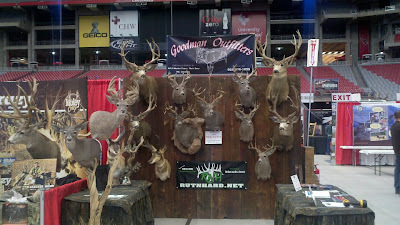 Big THANK YOU to Victory Archery for sponsoring the raffle and we appreciate the support given to Goodman Outfitters. Goodman Outftitters and all of our staff shoot Victory Arrows and we highly recommend you do as well. Check out their websiste for more infomation on there products. BIG AZ Antelope hits the dirt! My Brother Troy Goodman finally drew one of the tags that seems like we can never draw. Troy drew a unit 10 rifle antelope tag for the 2011 season. We love hunting antelope and we know 10 very well but we knew there was going to be alot of pressure and we needed to make it happen quick before hunters started pushing them around. After a few scounting trips we had a buck picked out. He was really heavy buck he had some serious mass and we knew with his mass it would get him up there. Opening morning found us looking through the glass bright and early at Troys buck and off we went to make the stalk. The years of waiting for the tag was short lived during the hunt as Troy connected with his giant and a buck of lifetime at that! Congrats again Troy and im glad we could be a part of it. We had outstanding late season hunts with both our late rifle clients and Archery Client harvesting some giants! My son Bryce also had a late rifle bull tag, he was only able to hunt one day and he and my son Tyler went out and connected with a really heavy old 6x. I really enjoy these late hunts with persistance and hard work we continue to provide our clients with opportunity at outstanding bulls. Below is Pete with his 2011 late rifle bull and Mance with his 2011 late ARCHERY bull. Huge congrats to both Pete and Manse. They both made perfect shots on there bulls and closed the deal when it was needed most. We had a fun and exciting early archery season. I was fortunate to have 2 of my good friends Chuck and Joe draw tags this year in the unit I love. I met both Joe and Chuck from a previous hunt they hired me for years back. We havent stopped talking since. Long story short we had a great hunt, seen lots of giant bulls, great company in camp and ended with success! Its the 21 days out of the year that is hands down the best. Here are Chuck and Joe with there bulls! The smiles say it all. Congrats again on your great AZ bulls! BBD! Bryces Big Kiabab Muley!! My youngest son Bryce has really taken on the same passion I have for the outdoors and really enjoys hunting as much as I do. He was lucky enough to get his hands on a late Kiabab tag in 2011. Being that we have spent many years on the kiabab we were excited for the hunt as we know what we have seen, and harvested in the years past. The kiabab is the home of Giant Muleys and we couldnt wait for his hunt to get here. Before we knew it we were in camp and our scouting proved that the giants sure do still roam these hills. We had a couple bucks picked out that were worthy to hang his covenant tag on, a Giant 235" with trash and a big 205" typical frame buck. We got into our area bright and early and as the sun came up we watched big buck after big buck chase does as we were in the the full swing of the rut. After a few hours of glassing we were finally able to pick off the big typical frame buck we seen earlier. It wasnt the big 235 but this buck was impressive and he was in a area which would allow us to make a stalk and get a shot off. Bryce made the call and said "I want that buck". So off we went and very shortly we were within range, we quickly set up Bryce for the shot. The buck was hot on some does and we had to make it happen quick before he moved into the cover they were heading for. With the video camera rolling, Bryce settles in and squeezes off the trigger. BBD! He made a great shot and put the big boy down. What a great hunt and outstanding buck, his buck scored 201" with very impressive mass. We could not have been happier! Brad Richardson with his 111" 2010 Super Raffle Buck.